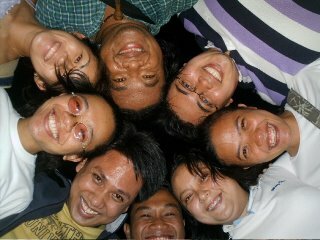 For the past three nights (26-28 May 2006), I have been with my JVP batchmates of batch 21 and boy what a riot. This was the first time we have met in great numbers, almost half (from 30) of our batch. We thought we would just have the simple "despedida" for April during the first night, but it had graciously extended to two more nights. Three nights of sharing, fun, and friendship. And because of these nights, I missed my batchmates. Hey JVPers, remember the feeling after OrSem, MidYear, or much more the YearEnd? When I went home during our last night together, I felt sad and alone. It was the same feeling, as if we have just finished another of these gatherings. Here are some of my personal reflections of what happened during those nights. 1st Night: What is Love? What is love? This is perhaps the very theme and question we tried to answer that very night, which is not a despedida for April accordingly. 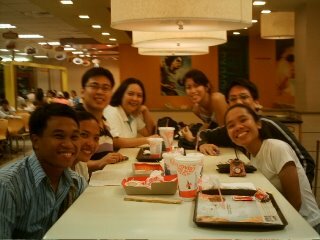 We met at McDo Katipunan (the official meeting place in Manila). I was the first one to arrive (kasi malapit lang), then Doc Cindy. Immediately we started with sharing many things, practically catching up in 15 minutes while waiting for others. For most of us, we haven't seen Cindy for four years and she really brought great joy to us because she was able to join us. And 15 minutes of sharing was definitely the fastest catching up I had for four years. Burg + Raymond (bf and now associate member) and Jq then arrived. 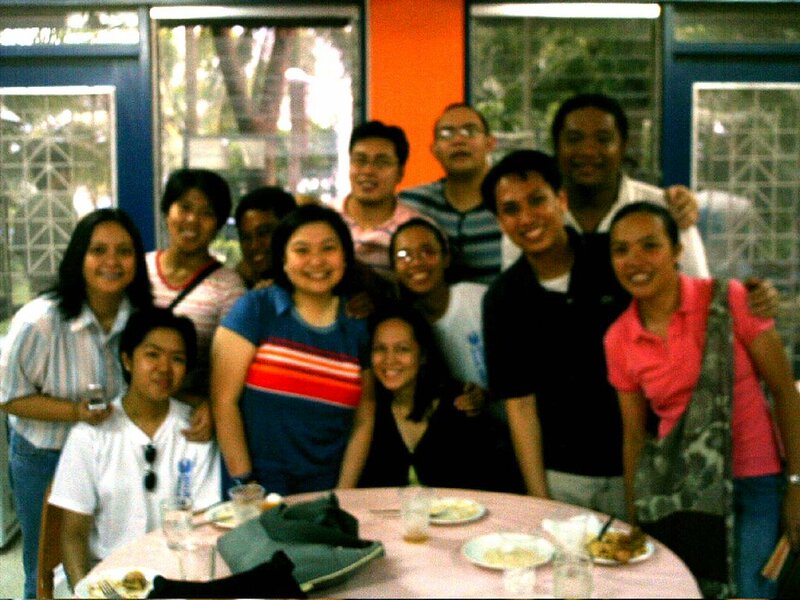 After some more chat, we left for April's place in Marikina. Jq and I also fetched Donna and Love (partner came from Naga who was helping out with the OrSem) from the maddening flash rains. After which we had dinner and that started the long bonding over one case of SanMig Light + 1 Strong Ice. April (well since this a blog I will sensor some "sensitive" details) narrated to us her ala Maalaala Mo Kaya love story. And truly I felt it was a painful experience for her and because of this she went a difficult time. However, she also found deep consolations on her experiences that made us realized how April has grown through this experience. That is why I was able to immediately say, "You are ready for marriage April!" So what did she say that made me say this? Unfortunately, I can't make the facial expression and say the exact words she said (even she herself can't also do that) because it was really the spur of the moment which made it truly genuine and true from the heart. Nevertheless, I will still try to put into words what she said that night though how inaccurate it may seem. "Kapag mahal mo ang isang tao, be sure of that. And when you are sure of that, be true to that so that kahit sino pa man makilala mo along the way, siya pa rin ang nasa puso mo dahil you are sure and true. That is love!" I hope I did justice to April's words, well something to this effect. Jay arrived next. Jay is still getting strong with Shanna. Yet sometimes, it was hard in a sense that it was long distance relationship in which it has brought about some complications along the way. Yet I was moved with how they let their love work which is again connected with what April shared. If you love someone, you will work things out with him or her. Talk, learn, and love again. It is a process of letting go the things that you don't need to build a growing relationship. Then dumating si JSK and boy what a "summer adventure" he had. Kung ano man iyon, ask him na lang. But what I would like to share are the thoughts that were still connected with April's story. Again, JSK's story speaks about being true to someone you love. Yet, there is a deeper part to that. And it is in longing. When you long for that love in loving someone, you will really go out of your way to find and get some, in which JSK did. But because in a sense it was forced, and brought about by many factors, truth will still find its place. And that truth is, you can't manipulate love, because love is powerful enough that it can find its way back home to you. 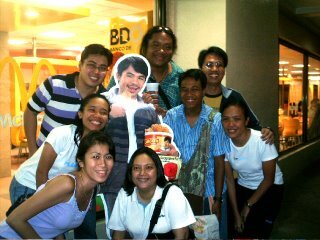 Surprisingly, Mark was in Manila and we were so glad that he was able to join us also. He is also doing fine with Bing. Their story added more thoughts and reflections on love. After hearing stories on love relationships, which perhaps have no significant meaning for me because of my status in life, my thoughts were caught in a glur of banging glasses of beers. First of all, I realized how much older we had become. Things in life were getting serious and mature, especially on love and living a life of love. Hay, kasi naman wala pang nag-aasawa sa atin. But most of all I sense another kind of love among us. And this love is being together as friends, sharing stories (even they have been told over and over again), and rekindling our common experiences. This is love. The mere desire to be with one another, talking, drinking beer, and eating isaw never seems to sound an old jukebox to us. This is love, our own union of hearts and minds. On the afternoon of the next day, we attended the Mission Mass of batch 27 and the mass was truly a feeling of renewal of our own JVP experiences. After a long while, it was first time for Jay to enter the Gesu. And whoever JVPers could ever forget that feeling of excitement, anxiety, and deep consolation during their own Mission Masses. April, Love, Burg + Raymond, Jay, JSK, Mark, Donna, and myself were there during the earlier part of the mass. Suddenly, nagulat ako. Nagulat kaming lahat. Nagulat rin ang ibang mga tao na kilala siya. Mia was there! Hay, kung makita lang ninyo ang aking facial expression when she sat by my side. We never expected her to be there. We thought she was in the states doing theology as a career. We were in our outmost gratefulness for her presence. Moreover, Jq came with Nono who came also from Naga to attend the affairs. It was such a blessing that many from our batch came. 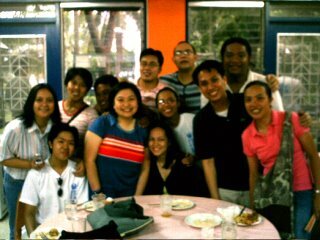 After the mass, we continued our gathering at the Cervini Cafe with the rest of the JVP community. And boy we were so noisy. We even sat at two tables combined. Kahit kumakain, kwento ng kwento pa rin. Then a big surprise. Leng arrived and everybody shouted with glee. Nakakahiya talaga pero sige lang kahit caught attention sa lahat -- batchmate kasi! Pero Leng didn't know the surprise she will get that night. Hay, sorry pero sensitive na naman ito kaya't no names and I will try to present it as discreet as possible. Ganito kasi. Meron isang guy na medyo hindi pa bati with Leng. Well, love issue that is. And kung pwede, in any JVP occasion wala sana ang guy. Why? All I can say is that Love really hurts. Pero this was the first time that we totally forgot about that when we invited Leng because the guy was there. Pero nan dyan na yan. Pati si Ate POVS binibiro si Leng. So we made fun with Leng by pretending to be her guard. Jay, Jq, and Jsk would stand beside Leng with their arms crossed and acting like scouting the are for enemies. It was so funny that when the guy passed around, automatically, there was a guard standing beside Leng. I even planned on a shift schedule. Because of this, Leng became conscious because she can't even finish a plate of macaroni. Impossible ito dahil matakaw si Leng. Joke lang. But what caught my attention that led me to reflect was the other side of love. Well, accordingly, this guy is willing to talk to Leng that night. However, he got the impression that we were guarding Leng as if we were ready to jump on him when he came closer. But we were just fooling around. But Leng is so happy now with her foreign connection. Leng is moving on. Yet the guy only wants to show peace. But the pain is still there and perhaps she is not ready to yet to talk about it. There was a point where the guy stopped his car beside us and there was a moment of vagueness, yet so implied to be a moment of reconciliation. Parang papatayin na lang ang ilaw, hindi pa nanyari. And you can't blame Leng or the guy because when you hurt someone you love, malalim ang sugat na hindi talaga hihilom. And I think it will never heal totally. It will heal in a sense that you can make friends with each other and move on, yet come to think of it, it is still there and it will always be there. But I am hopeful for the two of them because there is this desire to settle the past but not now, perhaps someday in the future. Afterwards, despite of our tiredness, we went to Countryside for a short dinner and chat. The guys updated Nono and Leng of last nights revelation. Then we parted ways. Again it was also unexpected that we met up for another gathering for the third time. This time it is in McDo Katipunan, the ever official meeting place of batch 21 in Manila. We ate dinner there and we talked all night long. Kung hindi pa nagsara ang McDo, hindi pa kami aalis. But it was the night of all night. It was like putting OrSem, MidYear, and YearEnd into one night. We tried to recall all the names of our batchmates, in their real names, including second names, plus birthdays. And proudly to say, we haven't forgotten anyone, no wrong spellings, and the birthdays were so accurate by the month and the date. While recalling names, we can't resist to smile and recall stories about them. We also pulled together all the news bits we have of our batchmates and surprisingly, we have updates for all. And this surprised me so much. How can this be? Eh kapag lumalabas kami mga taga Manila, minsan hindi pa complete, kami-kami lang. But how is it that eight of us that night can concretely say where and how is each and everyone is doing (well at least for some, the basics)? Miracle? Hindi man yata. I call this friendship. Kahit saan man ang bawat isa, we seem to naturally bond with one another and this makes our batch special. Nakakatuwa dahil kung tatanongin ang ibang mga batches meron mga lima o amin na wala silang balita. Ngunit tayo, tayong lahat meron tayong balita. And that is because of friendship -- union of hearts and minds. Sometimes, when we gather here in Manila, sitting, eating, drinking, and talking, and we realize, midsentence, that we are telling each other stories that we've already told each other before, maybe even more that once or twice! But before we have a chance to get embarrassed, we say to each other, "We don't remember you telling us," or, "That's okay -- we like that story," and we think to ourselves "What did we ever do to deserve such friends?" And we and I can't answer this question and perhaps will never will. Yet, this sense of attachment brings us so much joy in our aging that we don't mind to seek the answer. And for us that's just the way it is. In between our sharings, we eventually collected different jargons that were used and were apt during these three nights. We then come up with another edition of the batch dictionary which I will try to release it as soon as possible. After the love ko 'to experience, we went to Countryside for final showdown of beers. We shared few more stories and laughs then we went our way. We said our goodbyes and hugged each other so tightly. It was truly the best three nights. Parang nag-reunion na rin. How we wish it could happen again, but next time, if not complete, at least almost everybody will be there. We love you and miss you batchmates!